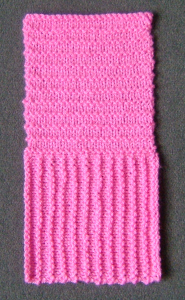 Knit one row. You have now formed one ridge. Ridge 2: Knit one row, purl one row. Ridge 3: Knit two rows. Repeat Ridges 2 and 3 until you have a total of 23 ridges, casting off on the second row of the last ridge. 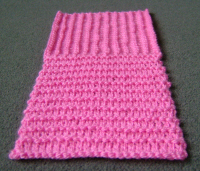 Knit one row. You now have one ridge on the new square. Odd numbers of ridges are needed if the squares are to start and end with the same type of ridge. Any piece of knitting looks slightly different when you look at it from various angles. The differences are often so slight that your brain doesn’t always acknowledge that they exist. 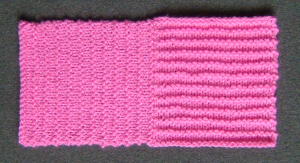 You can enhance the effect by knitting in ridges. The ridges start to produce their own tiny shadows. When the ridges all run in the same direction your brain may continue to ignore them. Work some of the ridges in a different direction and your brain starts trying to make sense of what you see. This sample is worked with one set of ridges running in one direction and the other at right angles to the first. A different effect is seen, depending on which way you look at it. Looking from an oblique angle changes the effect again.